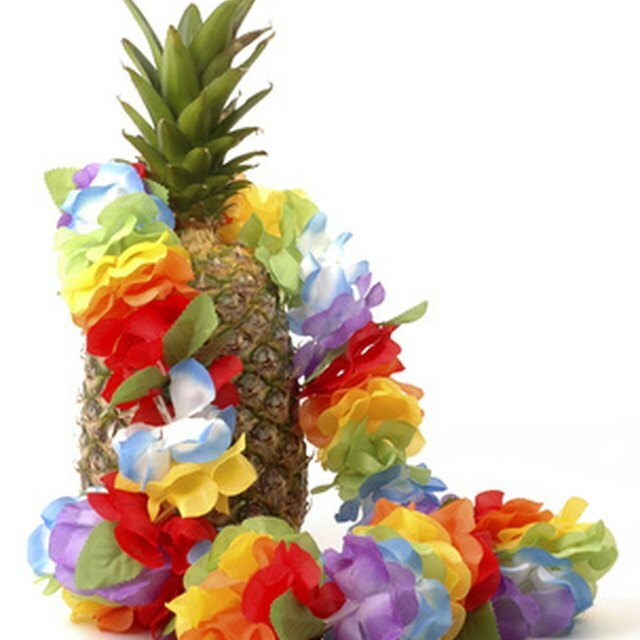 Luau parties can be very successful at retirement homes and senior centers. Parties and get-togethers are quite popular at retirement homes and senior citizen centers, particularly in the summer. One theme for a senior citizen party that is almost always a sure hit is the luau, which works well both in indoor and outdoor venues. Keep your party zone, be it a backyard or full dance hall, in mind when planning every aspect of your luau party. Bright, tropical flowers are a must for any luau decor. In addition to patterned tablecloths and real or fake flowers, have a selection of leis for guests at the door, as well as flowers for the ladies to pin in their hair. Inflatable palm trees can help set the mood if you don't have access to the real thing, as will tiki torches. Outdoor parties call for citronella candles, which are atmospheric and ensure your guests stay comfortable. If your luau party is at a senior citizens center, try having those in arts and crafts classes make paper lanterns to hang at the party. A steel drum band or calypso band would be perfect for this setting. If you'd prefer something a little softer, hire a ukulele player to serenade guests. Another option for those on a limited budget is to create a playlist of calypso classics. Prior to the party, ask a few of the senior citizens which calypso classics they most enjoy, like "Banana Boat" or "Yellow Bird." Tropical fruit drinks with colorful umbrellas will be expected, alcoholic or not. The traditional luau meal is roasted pig, which may be a bit complicated. Capture the essence of this classic idea by making ham, cherry and pineapple kabobs--slide cubed ham and the fruits onto a skewer and grill. These are also ideal as they don't require a knife and fork; guests can carry and eat them while they mingle. Stick to finger foods with options, like a large fruit salad in a hollowed-out watermelon, tempura-battered shrimp and sweet potato fries. The limbo is a classic luau contest, but might be a little difficult depending on the dexterity of your senior citizen guests. Plan a few fun activities that are less strenuous, such as "Hula Word." Inform guests that a certain word (ideally one that would be said a lot) is "forbidden," such as "hot," "flower" or "fruit." The first guest to slip up and say the forbidden word must wear a grass skirt. The only way he can take it off is if another guest is caught saying the word; then she must wear the skirt.